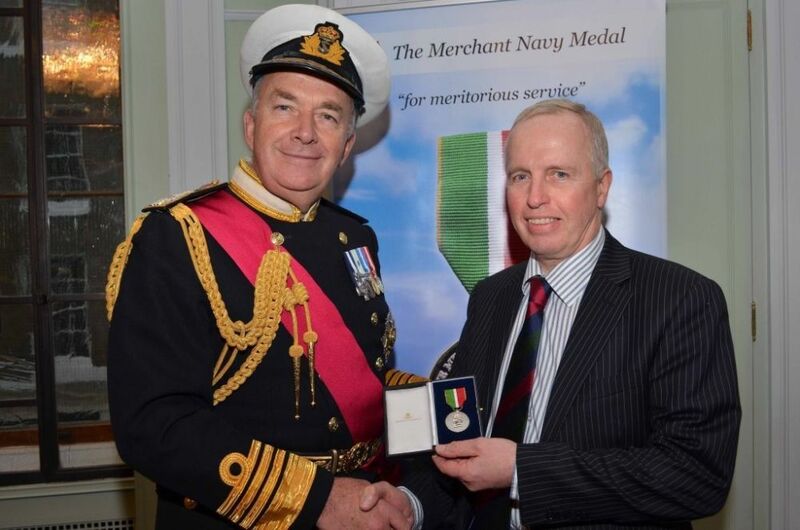 Colonel David Fuller OBE, until recently County Commandant of Humberside and South Yorkshire ACF, has been awarded the prestigious Merchant Navy Medal, showing that committed service to the ACF is no barrier to excellence in one's "day job" too. David is one of only fifteen people in the country to have been honoured with the award this year, which recognises meritorious service by British Merchant Seafarers. Awarded the medal for his service to the marine industry and to the Institute of Marine Engineering, Science and Technology, David is a Principal Marine Surveyor with the Maritime and Coastguard Agency, responsible for 2000 fishing vessels on the coast of England, ranging from the Scottish border to the Devon and Dorset border, and also has responsibility for 30 vessels in the Falkland Islands. David has served the marine industry for over 40 years, joining the Merchant Navy as an Engineer Cadet in September 1972, sailing with BP Tankers, the Indo China Steam Navigation Company and British Underwater Engineering. He ended his seagoing career as a Chief Engineer before taking an appointment ashore as Superintendent Engineer with Marr Fishing Vessel Management, based in Hull, followed by the Department of Transport and Germanischer Lloyd, a Classification Society for ships, before returning to Government service with the Maritime and Coastguard Agency, where he remains as Principal Marine Surveyor. He has been a member of the Institute of Marine Engineering, Science and Technology for the last twenty five years, serving as Branch Chairman from 2000 to 2002, during a period of some change within the Institute, and has raised a considerable amount for marine charities at annual dinners and other events. In 2011 David was appointed OBE in the Queen’s Birthday Honours for his service to the Army Cadet Force, which he has been a member of for over forty years. The Merchant Navy Medal was inaugurated during the Trafalgar Bicentennial year of 2005 and features a profile head of Admiral Lord Nelson, as a reminder of the time he spent as a young man on a West Indies merchantman, and the formative part the Merchant Navy played in the development of his outstanding seamanship skills. The medal was presented by Admiral Lord West of Spithead, at a ceremony at Trinity House in London. David is married to Alex and has two children, Sarah, who is 30 and works in the equine field in Derbyshire and Iain, who is 28 and a regular soldier serving with the Royal Army Veterinary Corps.